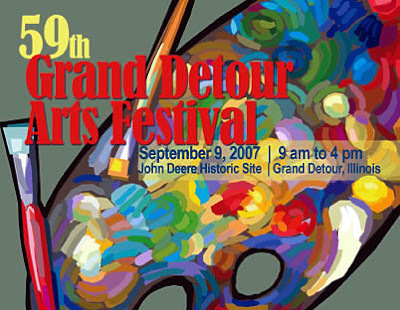 If you're in Grand Detour, Illinois area this Sun., 9/9, drop by the John Deere Site for the 59th Grand Detour Arts Festival. Weather is supposed to be in the 70s. Oh yeah. I received the Best of Show at last year's show. This might be my last year exhibiting at this show. Getting to be too much work, but anything can happen by next year. The postcard pictured above was designed by little ole' me.